Ran and conquered – congratulations Richard Hancock – our Marathon Champion! Richard says a lot of thank you(s) below – he is a very generous soul and everybody he does thank, we thank too, BUT our biggest thanks does go to you Richard. An amazingly selfless and terrifyingly hard thing to do – we are so grateful for the dollars you raised for cancer research!! 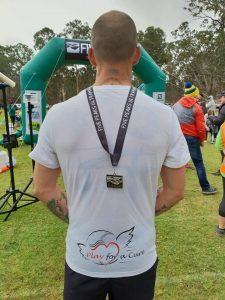 Check out Richard’s last BLOG on his 58km ULTRA Marathon Run and please feel free to donate by clicking here – Richard is hoping to hit the $1500 mark raised and he is just shy of this amount as of 23rd April 2018. Well the run has been completed, all 58kms of it. It started out as something I was curious to see if I could complete it, turning into a big fundraising effort with large amounts of support from many. If you have been following the day was quite ideal for such an event, a little blowy and wet but cool definitely better than a 30 degree day. The run started out a little daunting but once I was under way I switched off and let the screaming of whatever song I was listening to take me off step by step. Before heading off I had made a plan to stop at every hill and walk up them all, this was something I stuck with and I firmly believe that it is what got me through. As far as food was concerned I had gel’s that I took every 5kms and I had baby food satchels that I devoured every 7.5kms. With that I now know why babies only like the fruit baby food, chicken and vegetables did not taste as good as it sounds!!! Probably about 40kms in I did have a bit of trouble, my left leg cramped up bad enough to which I could see the full outline of my thigh muscle through my skins. I slowed up a little and stretched out my stride a bit more which seemed to help break up the cramp. Overall it was a great run, I had left believing it would take me 8 hours. I completed it in 7hrs 32 mins!!! I was 13th in my age group as well (BRAVO FROM P4AC). I really want to take this opportunity to thank a few people. To begin with the RAAF and more important 24 squadron, instead of being concerned with my trying to complete such a feat I was instantly offered support, and 6 of our personnel including my XO donated their time to manning an aide station and meeting me at the end of the run. I would like to thank Chris Sanderson for following me and being at every aide station to cheer me on, dragging his pregnant partner along with him, which whom had a healthy baby son the very next day. Congratulations guys!!! (CONGRATS FROM P4AC too!) Thank you to my wife and two boys who have shuffled their lives around my training regime and trail running days. Thank you to Play for a Cure for being such a great foundation and making my choice for fundraising such an easy one, and the constant messages of support. Thank you to my mother for making me the stubborn, determined man that I have become – I definitely couldn’t have made it through without the never give up attitude you have instilled into me. Last but definitely not least thank you to everyone that has supported me through this journey and have made a donation or sent me constant words of encouragement they have been very overwhelming and every word definitely helped me get over that line!!! I have to say this is the last big run I will possibly be doing for ever, whilst it was a great challenge it did take its toll on my body during a lot of my training runs and the run itself and I’m just not in the business of testing fate. Only injury I did end up with is I believe I’m about to lose a toe nail from the constant stress of my feet hitting the front of my shoes going downhill. So really I can say that I was very lucky with only getting away with that. I do plan on playing ADF Softball each year so the fundraising for Play for a Cure will most definitely not end . Thank you so much everyone for everything!!! The option to donate is being left open for the next few weeks as I believe an article on my run is being published next week in the RAAF news!! This entry was posted on Monday, April 23rd, 2018 at 1:11 pm and is filed under #Richard58, Events, News. You can follow any responses to this entry through the RSS 2.0 feed. You can leave a response, or trackback from your own site.